A strong pistol with plenty of endurance and flair! Zuru has been doing a steady overhaul of the Xshot line, featuring improved but older blasters as well as new models. They’ve also been doing them in a really nice white and blue color scheme. The line as a whole has improved, and Zuru deserves lots of credit for stepping up in the blaster arena. 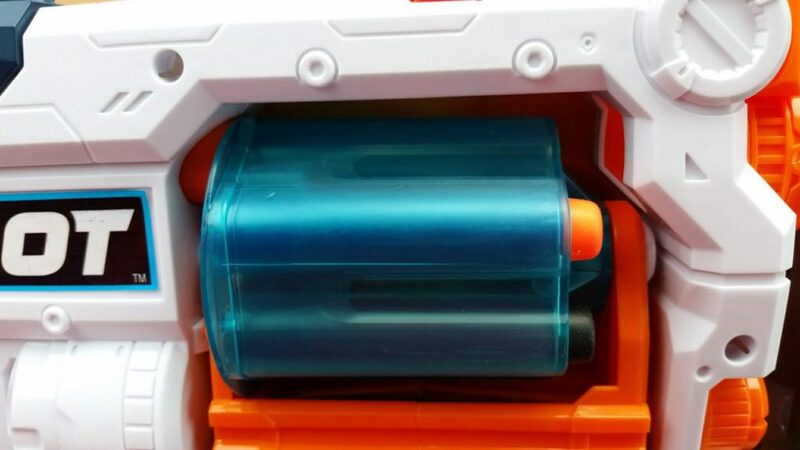 One of the newest blasters is a replacement for an old one, the Xcess. The new blaster shell features improved functionality, better dart compatibility, and a much better aesthetic, to the point that it’s my new favorite spring-powered pistol. 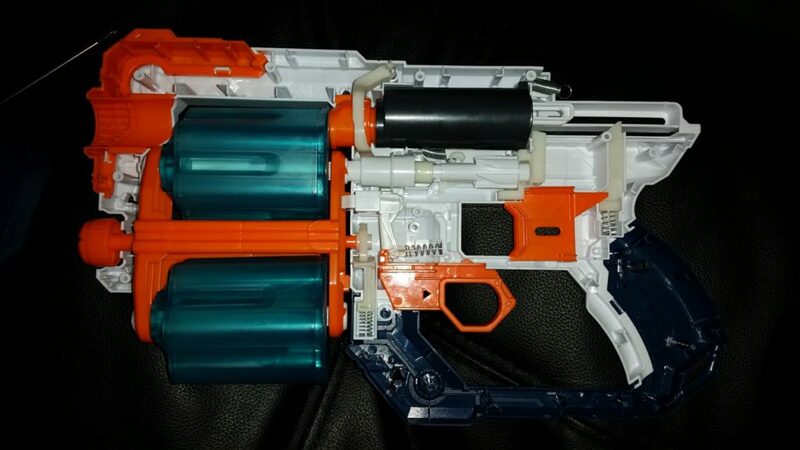 The Xcess was the first “flip cylinder” blaster on the market, taking after the old idea of adding cylinders to Mavericks. Prior to the new model’s release, it had been upgraded to get ranges of up to 80ft, generally through a stronger spring. It also kept the rather pointless disc shooter at the top. A spring-loaded clutch held the cylinder in place, and you changed by turning with enough force. Finally, it had one glaring issue: incompatibility with regular darts. 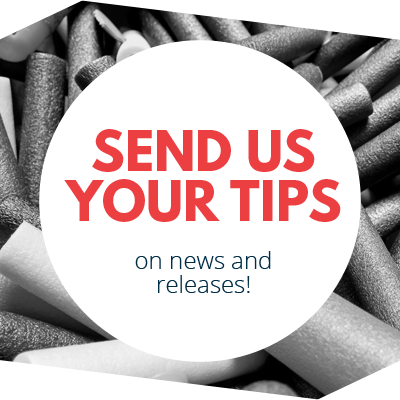 Most new darts are just a bit too long for the cylinders, and prevent it from rotating when priming the blaster. 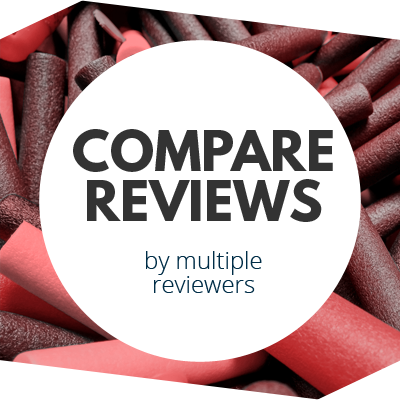 With the new model, compatibility is no longer an afterthought. Darts of all (.50) types fit in the cylinders, with room for the cylinders to rotate. The disc shooter is done away with. Even better, a second trigger has been added to initiate cylinder flipping. You still have to put the other one in place by hand, but it’s still a major improvement; pull the ring to disengage the clutch, and the cylinder flips out. The handle is still a tad small, but with a place or your middle finger to rest (the second trigger), it’s not as cramped as it could be. The new Xcess features a 49 mm draw, with a 27.5 mm diameter plunger tube (1.93″ and 1.08″, respectively). That amounts to 29.1 mL of usable plunger volume, which is respectable for a pistol. The secondary trigger attaches to a lever that pulls back the plunger tube and the rotation mechanism, allowing free rotation of the twin cylinders. Rotation of cylinders occurs upon priming. I have not yet attempted to see how well a new spring would be supported. I ran the Xcess for a few rounds at an HvZ event last weekend, and the blaster performed beyond expectations. It took and fired all darts well, and it was easy to flip cylinders to reload one set of six while firing from the next. This made it ideal for rounds requiring lots of running (like our capture the flag round). The included darts aren’t the most accurate, but the new push on dart compatibility makes up for that. After firing several dozen rounds each through a chronograph, I can report that the new model hits 80fps average with Xshot darts, and 75fps average with Nerf Elites. These are great numbers for a stock pistol. The Xcess is the result of much improvement over an already improved but still flawed older model. Range claims of up to 90′ are easily achieved, both with the included darts and other types. Operation and combat use are simple and consistent. 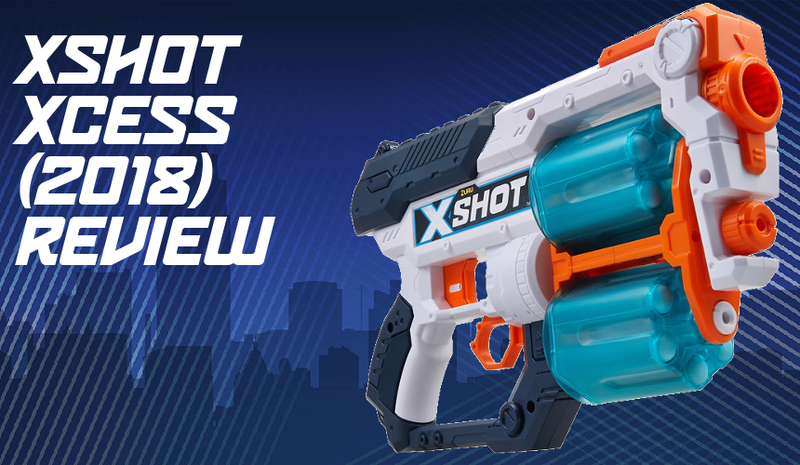 Overall, the Xshot Xcess is a great blaster at a great price point. 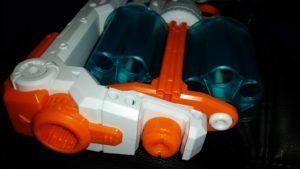 This entry was posted in Dart Blasters, Reviews and tagged 2018, blaster, blaster hub, review, xcess, xshot, zuru on August 1, 2018 by BuffdaddyNerf. Burlington Coat Factory? 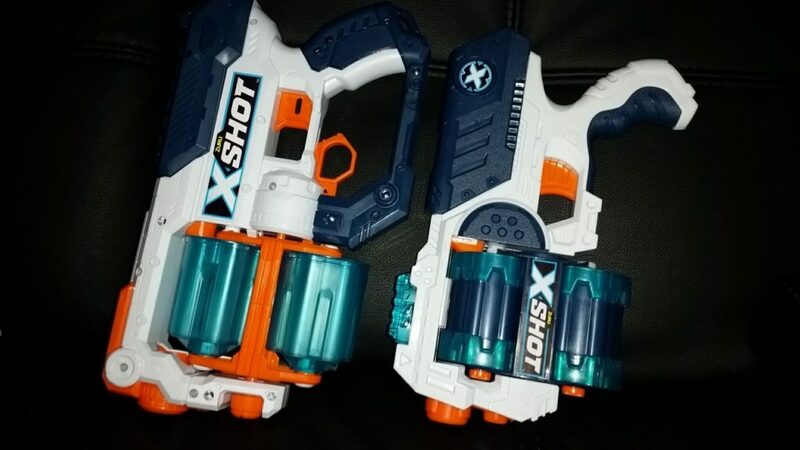 Not my first choice to look for blasters but I have been wondering where the hell the new X-Shots are supposed to go now that TRU is gone.